Welcome to the Damask Divas March blog hop featuring the new paper pack called Chantilly. If you came here from Amie’s blog, you are in the right place. If you get lost along the way or just want to return the list of blogs, click here on Damask Divas. I love this paper pack. The colors remind me of Spring. I purchased the CTMH Workshop on the Go for Chantilly cards. 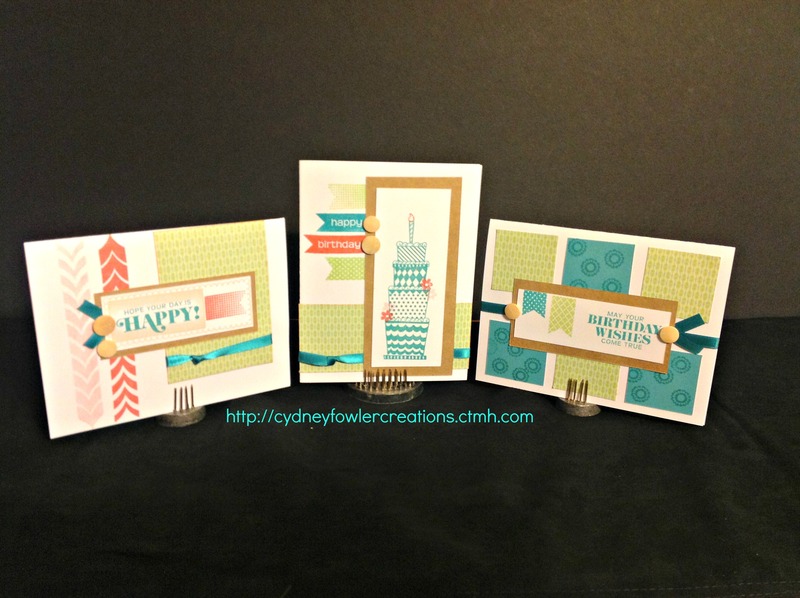 You get the supplies to make 5 each of 3 different birthday cards for a total of 15 cards. I really needed to have some birthday cards on hand, so I decided to create these cards for the hop. You just need a few tools, some ink pads and the kit. I didn’t have the Desert Sand or Sunset inks called for. I was able to substitute Taffy and Smoothie and it worked just fine. I think these layouts would look great in other colors. Be sure to save your kit instructions so you can try other combinations. Very nice, so fun to get inspired by projects from Close To My Heart’s WOTG kits. Love this Card Workshop. I cannot wait to work on mine. I am planing to make more combinations also. Great job!! Hey, I used this kit too! Great job, your cards are really nice! Very nice job on the cards!!! Love the colors. Thanks for your comments everyone. Glad you like the cards! Love your cards,that Lagoon ribbon is FAB! Having a kit is a good idea. Once you have directions you can substitute colors and embellishments as you wish. Great cards. Nice job! So cute and I love the WOTG! So Fun! I really love your cards and the fact that they are from a card workshop. I might just have to try one of those. TFS. These are very nice cards, love the colors.